Aerospace & Defence is a €540bn ($660bn) global market. It comprises large OEMs as well as a complex supply chain of primarily middle-market companies. With hundreds of niche markets, the Aerospace & Defence sector is one of the most fragmented in the industrial space. As a result, M&A has served as a catalyst to spread operational best practices to address common challenges within the sector, from on-time delivery to efficiency. In our new report, Baird's Global Investment Banking team discusses valuation drivers and M&A trends in this attractive investment sector. 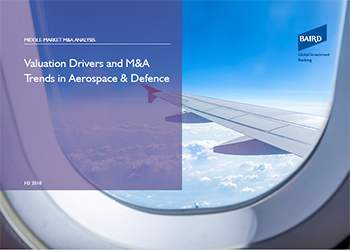 Our analysis of over 280 mid-market Aerospace & Defence M&A deals, across ten subsectors, yielded an average valuation of 11x EBITDA. To request a copy of the full report, please email Tahs Siddique.